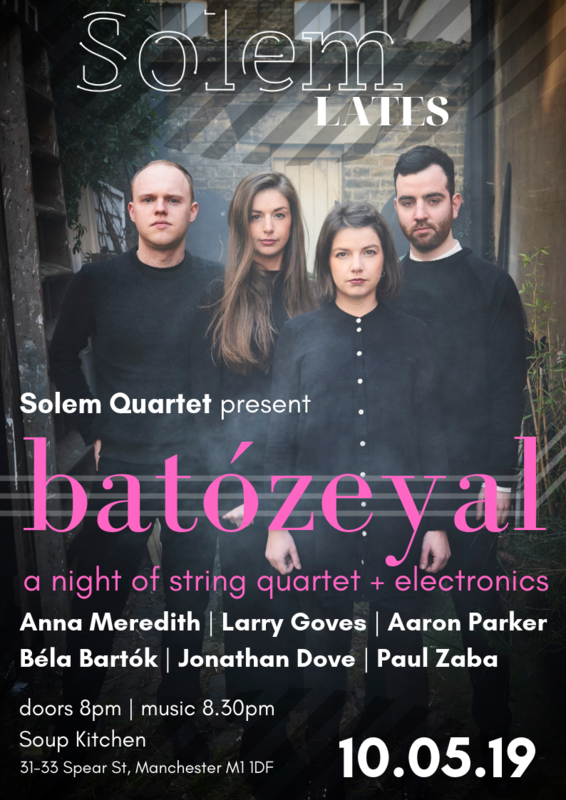 In the first of a new series, Solem Lates, the Solem Quartet present 'batózeyal': a night of music for string quartet + electronics. Excitingly, batózeyal will feature two specially commissioned premieres, from Larry Goves and Aaron Parker, alongside Anna Meredith's Tuggemo, and other exhilarating recent works from Jonathan Dove and Paul Zaba. In the context of this contemporary music, we will also be performing Bartók's 3rd Quartet (bit.ly/2M6IdEY) which sounds as fresh and visceral as it did at its conception, almost 100 years ago. This event takes place on 10th May at Soup Kitchen, Manchester - so come have a drink and immerse yourself in some incredible new music! The title of the night 'batózeyal' shares its name with the piece by Aaron Parker, which responds to and interacts with the Bartók Quartet. We hope that throughout the evening, the listener will be able to draw their own connections with music from the past and also from contemporary culture.